Net Entertainment are known for pushing the boundaries, when it comes to creating high-quality, exciting gaming experiences, and whether it’s Video Slots, Casino Table Games, or Instant Win titles, they’ve managed to captivate millions of players around the world, with their fair, enjoyable, mobile-optimized game range. Mario and Friends is another brand that’s achieved global fame – and fans all around the world enjoy various Video Games, Comics, and Mobile Games featuring Mario, and his companions. How’s this relevant you ask? Well, it’s all to do with Reel Rush; the Net Entertainment slot inspired by Mario! (OK, while there’s no official affiliation with Net Entertainment and the creators of Mario, it’s impossible to see the striking similarities). Reel Rush is designed using the Chinese-originating “video game blocks” style, where everything is simple, fairly basically-designed, yet high-quality. The background of the game closely resembles the type of layout you’d see on a Mario game, with the reels using a transparent effect to blend in beautifully. Symbols on the reels include a selection of fruits (although you’d be forgiven for not recognizing them as such), and this includes Oranges, Plums, Lemons, and Strawberries. There’s also coin-like symbols, which vary in colour – these are the low-paying symbols, much like playing-card symbols you’d see on other titles. The minimum spin is just 25p, and like all Net Entertainment titles, you can customize your stake, and game preferences from the bottom of the screen. Reel Rush is unique in the fact that you initially only start with one symbol exposed on the first reel, three on reel two, five on reel three, 3 on reel four, and one on the fifth reel. 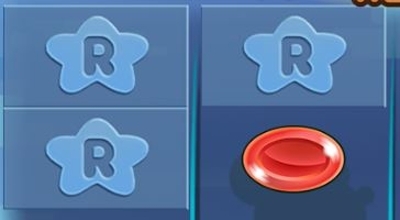 Now, you’ll see there’s a variety of squares on the game board, where, on other slots, you’d normally see symbols – these are the blue stars with an “R” in the middle. Each time you win, you ‘unlock’ more of the game board, and if you manage to win 6 consecutive spins, you’ll enter a special bonus-round, where the entire board is unlocked. You’re awarded 8 free-spins, and the game uses the 3,125-ways-to-win structure, meaning you simply need to land one symbol on three or more consecutive reels to guarantee a win – pay lines no longer matter. It’s possible to win a lot of money during the free-spins, especially if you manage to make 5-of-a-kind pay lines with multiple-same symbols on one reel! While you can’t re-trigger the free-spins, it’s generally not that hard to trigger – although expect a lot of anxious finger crossing on the final spin before the free-spins. Reel Rush is really cool – and if you like playing it, you’ll want to check out When Pigs Fly, which features an almost identical game experience, with a different theme. 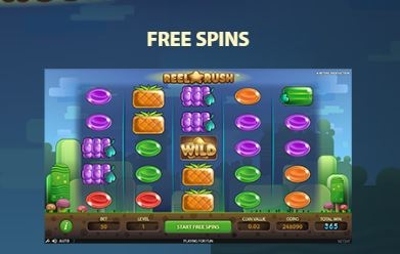 Reel Rush is one of the most popular slot games, and it combines high-quality audio and visual experiences with gambling, allowing players to enjoy a unique experience.